Kyle Pucko, podcast host, and Talia Zook, digital marketing specialist, test audio before a recording. On average, people cry three times during the first-time homebuying process. Knowing what a mortgage is and identifying the people who play a role in the journey to homeownership can be challenging and confusing. 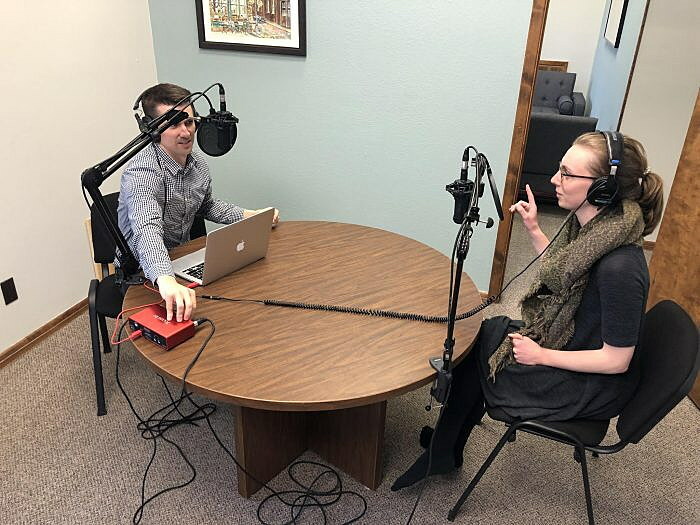 Now Kyle Pucko’s Missoula-based marketing agency, Pintler Group, with help from University of Montana student Kassi Strong, have started an online podcast called “Closing Day” to answer many of the questions that novice homebuyers have. When Pucko bought his first house, he still had some uncertainty about the process and whether he made the right choice on closing day. The podcast has six episodes so far that address renting, buying, mortgages, real estate agents, lenders, and budgeting for a down payment. The group brings in different experts from different companies and organizations to talk about the process without influencing the information the podcast provides. Strong, who produces the podcast, said that resources like this are helpful to everyone, but especially Millennials, who statistically head fewer households than Generation Xers or Baby Boomers, according to Pew Research Center. The team provides advice from Missoula-based experts, organizations and companies, but the information provided in the podcast can be used by anyone. The goal is to give listeners the tools they need to move forward or find creative ways to own a home. In the future, Pucko hopes to address other housing topics, like investing in properties and even the emerging trend of young generations living in tiny homes. Overall, creating informed homebuyers is what the podcast aims to do. “I want to share that information and just show people that you don’t have to be a doctor or a lawyer to afford a home and to navigate this process with some success,” Pucko said.